What's all this Ebike buzz-chat about, anyway? What’s all this Ebike buzz-chat about, anyway? If I suggested to a cycling-mad pal of mine that he should switch to electrically powered bicycles his verbal response would most definitely not be printable here. Why is that? Well in his case, even as a gentleman of mature age, he has sufficient pedal-power to propel him and his bike on a cycling odyssey which took him from Barcelona to the city of Bristol. Not only did he self-propel himself over the 928 miles journey but also completed it in 8.5 days. That’s a phenomenal 109 miles/day average. And this was no Ebike but a classic made in Bristol in 1950 with 4-speed Sturmey Archer gears. Of course not all of us have the Herculean thighs and mental tenacity to do that and the idea of an electric hybrid bike bike (Ebike) does have its attractions – especially if you happen to live in a bike-friendly country like Holland, although paradoxically the Ebike craze in that country is causing concerns. But more on that later. Here in the UK however, despite all the environmental hyperbole that spouts from our politicians’ lips that cycling is greatly encouraged in this country, this is not a cyclist’s paradise. It’s well recognised that cycling is a healthy and environmentally friendly way to get about so why is only approximately 1% of the UK’s annual transport budget spent on making cycling safer and more enjoyable in this country? This somewhat miserly sum compares unfavourably with the likes of Holland and some other EU countries where the spend is as high as 10%. Putting it in simple terms, cycling on UK roads is a very risky business. In 2016 a total of 102 cyclists were killed and an astonishing 3387 seriously injured. So given all this where do Ebikes fit in? Clearly when it comes to the Netherlands, Germany, Denmark, Belgium and France very easily. Ebikes have proved a marketing success in those countries. In Holland, for example, close on 28% of all new bicycles sold are electric powered. A total of 1.6 million electric bikes were sold in Europe in 2016. The picture in the UK is less rosy but is improving and Ebikes are now even getting support from the likes of Olympic champion Chris Hoy because they will get more people cycling. Very easily. For those of you that remember having dynamo-powered lights on your bike just imagine that the light has been replaced by a battery. The battery would then send a steady current driving the dynamo in reverse so that it spun around like an electric motor. As the dynamo/motor turned, it would rotate the bicycle wheel and make the bike go along without any help from your pedalling. That’s a very simplistic way of looking at it and not exactly how modern Ebikes roll along these days. There is no doubt that Ebikes are growing in sophistication and lightweight lithium-ion batteries providing up to 500W enable a range of about 30 miles depending on how you pedal and how many hills you encounter. Speeds vary between 10 to 18 mph. Ebikes have motors that are either built into the wheel hub or mounted in the centre of the bike and connected to the pedal sprocket. The hub motors work by having electromagnetic fields fed to the motor windings and the outer section of the motor follows these fields and consequently turns the wheel. Hub motors come in three basic designs. There is the axial-flux motor, where the stator windings are typically sandwiched between sets of magnets. Then there are two radial designs with the motor magnets fixed to the rotor. In one of them the rotor sits inside the stator, as in a conventional motor. In the other, the outer-rotation motor, the rotor sits outside the stator and rotates around it. Another technology area that can apply to Ebikes is regenerative braking. When you’re riding along, energy flows from the batteries to the motors, turning the wheels and providing you with the kinetic energy you need to move. When you apply the brakes this reverses the process and power to the motors is shut off. Now it’s the wheels that turn the motors and they become generators that produce, rather than consumer electricity. It’s a great idea and it does work very well in trains and cars. But it’s not great with Ebikes which don’t have the weight to create long distance momentum when coasting along. But the technology for Ebikes is constantly evolving. Only recently new magnetic solutions for Ebike charging were unveiled by a company called Premier Magnetics. That company has been chosen by electronics firm Power Integrations (PI) as the new supplier of magnetic solutions for its reference designs for Ebike charging. 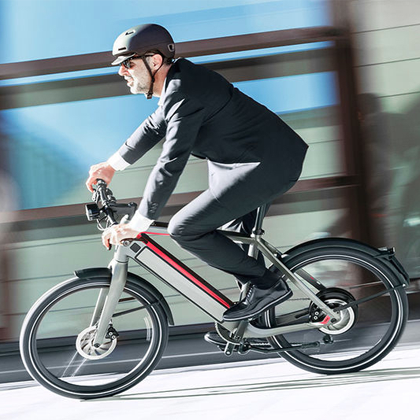 PI has published two Design Example Reports, DER-580 and DER-484, on its Ebike microsite. DER-580 provides advice on building a 118W high-line input non-PFC CV/CC flyback charger. This charger outputs 59V, making it appropriate for charging Li-ion batteries that power Ebikes. The second reference design, DER-484, is for building a 300W forward power supply with dual outputs of 61V and 5V. There is no doubt that Ebike popularity is growing and in terms of cutting atmospheric pollution they are a good thing, although it should not be forgotten they are not as environmentally clean as human-powered bicycles. There are still some very important questions to be answered about how lithium-ion batteries are made and how the toxic materials used in them are mined. There is also a big question about how they are recycled and of course charging Ebikes does take electrical power from the grid, which in itself is polluting. But that said they are better than internal combustion engines. But beware of one thing. Retuning to that safe haven of cycling, namely Holland, accidents statistics there in the past year have shown an increase in cycling fatalities and injuries and the underlying reason for those is the increased number of 65 year olds and over buying Ebikes and then finding they can speed along with traffic, sometimes with disastrous results. On the plus side though it does mean that should a pensioner suddenly develop the desire to cycle down to Barcelona via the Pyrenees then they wont need those Herculean thighs.